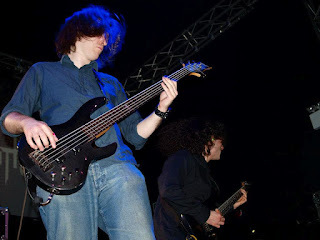 My second gig with extreme prog-metallers Carpathia was set within the extremely pleasant grounds of the University of Hertfordshire. The night before the gig, we undertook a final rehearsal. Tom "we've got multiple poo-ers!" Sullivan had been writing lyrics and melodies for 'Solitary Red', which had up until recently been known simply as 'Fifth Song' and, at our last gig, had been entirely instrumental. During the rehearsal we fine-tuned vocals and solos, while adding final polishes to the other two tracks to be aired at the gig the following evening. The rehearsal itself went very well, with everything sounding suitably monstrous, so we downed tools and packed up the motor ready for the next day before heading back to Carp HQ. Tom "toe, ball, down" Atherton, Sully and I settled down to watch some splendidly unsettling Asian cinema with a bottle of vino and a bar of Fruit 'n' Nut. It doesn't get more rock and roll than that, kids. I made myself a makeshift bed out of bits of sofa and kipped down at silly o'clock. In case you were wondering, yes - the photo is the right way up. After Sully left for work I must have nodded off again, because I was then woken up by Athers with a pain au chocolat. Second breakfast! Just like the hobbits! All I had to do in return was help him out with carrying his shopping back, which sounded like a bargain to me. The toilet in the boy's flat has not been working too well recently, which has had some deeply unpleasant results - in fact I'm fairly confident that new life forms will emerge from the murky depths any day now - so Athers and I took advantage of the comparatively pristine environment of Tesco's customer toilets to dispose of our solids and effluvia. Shopping was followed by lunch and the triumphant return of Sully from werk. The boys introduced me to Metalocalypse, an animated series sending up heavy metal, which after some initial puzzlement caused me quite a few lulz. Then it was time to hit the road. 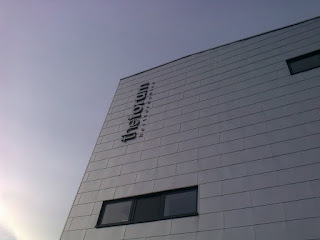 It turned out the gig was even closer to the boy's flat than their own studio. En route, I had received a text message from Paul "I feel like a Disney princess!" Nazarkardeh who had plonked himself in a dressing room. 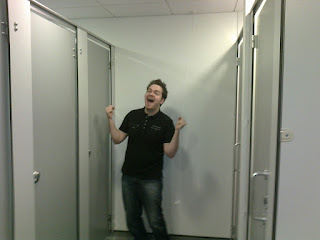 By the time we arrived, he'd been kicked out of the dressing room which, apparently, we weren't allowed to use. After loading the gear in we were sent to the staff room to chum around with other bands and staff until it was time to soundcheck. Peter "a PhD...in boats" Mannion and I were delighted to find all sorts of coffee paraphernalia dotted around the room, although it took us until the kettle had boiled to realise that there was no coffee. Sigh. Ziltoid wanted to pose with Black Polaris. Soundcheck was going to be a bit late given that headliners Mordecai had been delayed in arriving, so we kicked around backstage. 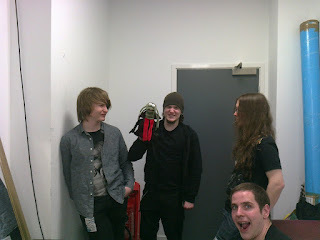 Venue staff and fellow bands were delighted that they had an opportunity to pose with Ziltoid, who is proving to be something of a hit on this gig circuit. Eventually it was our turn to make some noise, so we went onstage and plugged everything in. One of the quickest soundchecks of my life followed (rather along the lines of "Give me some guitar"....*guitar noises*...."OK, thanks. Bass?"...etc.) which was especially welcome as we were now running dangerously close to the doors opening. A quick verse of old favourite 'Truth of the Moment' to ensure monitors were good, and we were off again. While piling our gear in the backstage area we were advised by the health & safety patrol to move all our gear into the dressing room. The dressing room we'd already been removed from that we weren't allowed to use. Splendid! During soundcheck, we had the bright idea of getting the band logo displayed on the screens dotted around the stage and bar areas. The logo resided on Tom's phone and needed to find it's way to the sound man's computer via a USB stick. Thusly, while Sealed In Scarlet and Atopia were gracing the stage, an extremely silly chain of technology needed to be constructed in order to get the logo where it needed to be (Tom's bluetooth wasn't working, so he emailed it to Pete, who bluetooth-ed it to my laptop, where it was then loaded on the USB stick from within my keyboard and delivered to the sound man before being taken back to put back where it belonged...!). Then it was time to hurriedly load everything onstage and get going. Predictably, from a student metal crowd, Ziltoid got huge cheers and cries of "I demand your finest coffee, humans!" when I brought him out and tied him to his microphone stand. The intro tape rolled and we were off. I'd normally find a half-hour gig slightly unsatisfying, having been in Hi-On Maiden for so many years and played so many near-2-hour shows. However, this music sounded fawkin' HUGE, and the atmosphere onstage was infectious - I was a huge sweaty mess by the time I came off stage from the copious head-banging I'd been indulging in. The re-vamped and re-vitalised intro to 'Solitary Red', with Sully's best black metal screams really sounded like a mission statement, and from there the set just flowed superbly. My drum pads stayed firmly attached to their stand, the cowbell rang out, I could hear myself through the monitors, and each of us played our socks off. 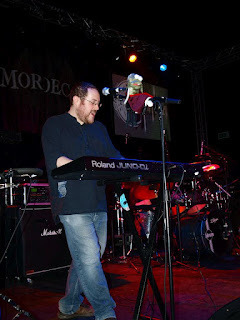 The slightly frustrating thing about playing keyboards is the inability to move around the stage. I'm used to being able to wander over to stage left and rock out with the other guitarist, or go and pull silly faces at the drummer. Instead I had to settle for people coming over to visit, and doing silly dances in the short bars where I have nothing to play in an attempt to get a chuckle out of Athers. I did get a visit from The Onion, which was very pleasant, but Paul fared less well trying to get over to my side of the stage for our harmony lines at the end of 'Finding It Hard...'. I think he tripped over Sully's cables! Onion and Nazgul give it some. Last train out of London Bridge - all aboard the Pisshead Express! As ever, I'm looking forward to the next one! Unfortunately my Hi-On gig schedule has already scuppered a potential date in Brizzle, however I'm sure there'll be plenty more coming up. Any venues interested or any bands with tours booked looking for a support act, get in touch! 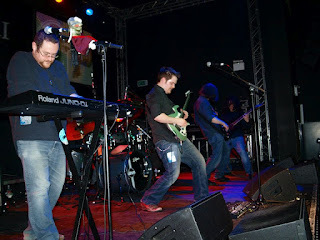 PS: Gig photos courtesy of Adam Pirmohamed and the University of Hertfordshire Alternative Music Society.